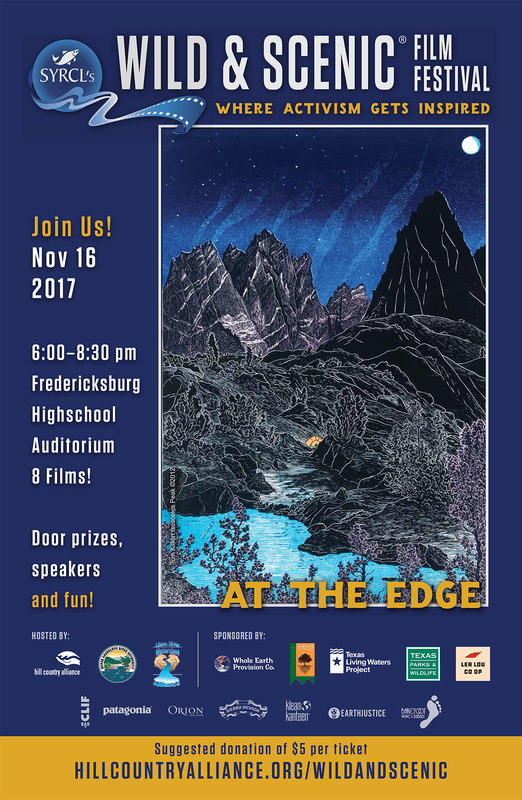 Join us for a stunning collection of 8 films highlighting iconic scenery, conservation efforts, and remarkable adventures! We’ll watch elk traverse mountain tops, hear from 4th generation cattlemen, and see a Hill Country ranch brought back to life. Door prizes and great information from our knowledgeable hosts and sponsors will be available too! Please arrive 30 minutes early for check-in and to get your ticket for door prizes. Texas Parks and Wildlife Department, Texas Living Waters (a partnership of the Sierra Club and National Wildlife Federation), Whole Earth Provision Co, Schreiner University Trull School of Sciences and Mathematics, Fredericksburg Independent School District, Odeon Theater, Clif Bar, Patagonia, Orion Magazine, Sierra Nevada, Klean Kanteen, Earthjustice, and Barefoot Wine & Bubbly. A special thank you to the Wild and Scenic Film Festival!